Moore’s law states that, broadly speaking, computer hardware tends to double in performance every two years. And Frontier are building Elite: Dangerous with that sort of exponential change in mind, folding support for “beautiful” effects and ultra high-res displays into their PC space game. One day, David Braben expects we’ll be able to use them. “We’re going through some wonderful effects internally that look truly beautiful, and we’re saying, that slows the framerate a bit, doesn’t it?”, Braben told Eurogamer at last week’s Develop conference. Once Mr Moore waves his wand, Elite: Dangerous will be ready to take advantage of cheaper and more powerful graphics cards. “Moore’s law is our friend,” said Braben. “Even if your PC of today can’t run with all the features on, your PC of tomorrow might. Braben noted that 4K displays are on their way, with 8K already following in cameras. That kind of resolution would “traumatise” even Titan-laden PCs today, but will eventually be able to make the most of Elite – because its models are “so detailed”. “And so I love the idea of being pretty future proofed,” the Frontier founder finished. 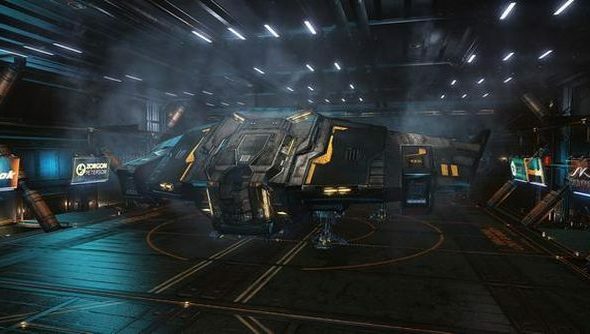 Have you had a topsy-turvy swoop around the Elite: Dangerous premium beta 2 yet? I hear the ships have got bigger, to say nothing of the stations.